Walter Jospin’s practice focuses on SEC and other securities regulatory enforcement matters, corporate governance, internal investigations, and SEC Whistleblower Claims. Mr. Jospin is the former Director of the Atlanta Regional Office of the U.S. Securities and Exchange Commission, where he served from February 2015 until January 2018. As Regional Director, he led over 110 lawyers, accountants, and compliance examiners in the office’s Enforcement and Examination programs, which cover Georgia, Tennessee, Alabama, North Carolina, and South Carolina. During his three-year tenure, Mr. Jospin supervised many enforcement actions relating to financial and accounting fraud, disclosure failures, audit failures, offering frauds, Ponzi schemes, violations of the Investment Advisors Act, municipal securities, and insider trading. In the early 1980s, Mr. Jospin was a staff attorney with the Division of Enforcement of the SEC in Atlanta, where he investigated and litigated financial and accounting fraud cases, including the first accounting case under the Foreign Corrupt Practices Act. Prior to joining the SEC in February of 2015, Mr. Jospin was a long-time partner in the international law firm of Paul Hastings LLP, where he was a member of the firm’s Policy Committee and Compensation Committee, and Chair of the Atlanta Office Corporate Department. At Paul Hastings, he specialized in corporate governance, internal investigations, securities regulatory enforcement, and corporate transactions. Representation of a special litigation committee of the board of a publicly-held insurance company in an internal investigation relating to allegations of financial fraud. Representation of a special committee of the board of an NYSE listed company in an internal investigation related to allegations of director misconduct. Representation of the audit committee of an NYSE listed clothing manufacturing company in an internal investigation in connection with a whistleblower complaint. Representation of the independent board members of a publicly held REIT in connection with various governance issues. Representation of the independent directors of a publicly-held bank holding company based in Coral Gables, Florida with respect to, among other things, strategic alternatives and a transaction with an affiliate. Representation of a special committee of an NYSE listed company in connection with evaluating strategic alternatives. Representation of a special committee of an NYSE listed insurance company in two separate internal investigations relating to: (a) allegations of insider trading by a board member, and (b) allegations of revenue recognition improprieties. Representation of a special committee of the board of a Hong Kong listed software company in an internal investigation related to alleged misconduct. Representation of the independent directors of a NASDAQ listed manufacturing company in an internal investigation and related SEC investigation involving alleged stock option backdating. Defense of a former securities analyst in an insider trading investigation by the U.S. Attorney for the Northern District of Georgia and the SEC. Defense of a partner of an investment advisor in an investigation and administrative proceeding brought by the SEC. Defense of a NASDAQ listed software company in an SEC investigation relating to revenue recognition issues. Defense of the CEO of an NYSE listed technology company in an insider trading investigation by the SEC. Defense of a NASDAQ listed grocery store chain in an SEC investigation relating to financial reporting issues. Defense of the CEO of a NASDAQ listed hotel company in an insider trading investigation by the SEC. Defense of the CFO of an NYSE listed jewelry store chain in a financial fraud investigation by the SEC and the U.S. Attorney for the Eastern District of New York. Defense of an NYSE listed technology company in connection with an SEC and U.S. Attorney investigation relating to disclosure matters. Defense of a national broker dealer in a Georgia Securities Commission investigation relating to sales practices. Defense of a managing director of a bulge-bracket investment bank in an SEC investigation relating to the pricing of interest-only mortgage backed securities. Defense of a broker dealer in a FINRA investigation relating to sales practices. Defense of an investment advisor in an SEC investigation relating to suitability issues. Defense of a large regional bank holding company in a FINRA investigation involving compliance matters. Defense of numerous registered representatives in investigations by the NASD and FINRA. Sale of Assets by Kloeckner Metals Corporation to Blue Tee Corp.
Sale of The Paradies Shops to Freeman Spogli & Co.
Mr. Jospin has been recognized as a leading corporate and securities lawyer by Chambers USA, The Best Lawyers in America, Who’s Who Legal Georgia, Who’s Who of International Mergers & Acquisition Lawyers, Georgia Super Lawyers, and Corporate Counsel Super Lawyers. He served as Chair of the Business Law Section, and Chair of the Securities Committee, of the State Bar of Georgia. Mr. Jospin is an adjunct professor at Emory Law School, where he teaches Securities Enforcement. Mr. Jospin has devoted a great deal of time over the years to non-profit organizations. He is presently the Board Chair of Georgia Innocence Project, a member of the Emory Alumni Board, and a Life Trustee of the Anti-Defamation League (SE Region). His previous leadership roles include serving as the board chair of the following non-profits: Atlanta Legal Aid Society, Georgia Legal Services Foundation, Anti-Defamation League (SE Region), and Zaban-Paradies Couples Center. 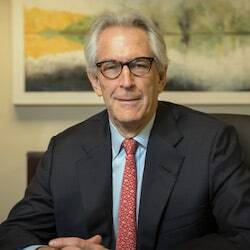 He has been a board member of the High Museum of Art and Atlanta Volunteer Lawyers Foundation, and he served as general counsel and co-chair of Major Gifts for the Jewish Federation of Greater Atlanta. A native of Savannah, Georgia, he graduated from the Wharton School, University of Pennsylvania, and Emory Law School. At Penn, he was a member of the Freshman Heavyweight Crew.